DeKalb residents and businesses learned the hard way with the recent water main break and boil water advisory the reason our county must finance infrastructure upgrades. However, the general public needs to understand in laymen’s term how small errors in the recent water main break created a countywide crisis. We met with the owner of GS Construction, Alessandro Salvo, in February 2015 concerning an issue and conflict with specification W-019 on covering the water main after repair with Watershed and Capital Improvement Project (CIP) administrators. Salvo started warning DeKalb early in the year of potential problems with the installation of water mains using #57 stone as bedding and backfill. However, the warnings were met with acts of retaliation such as multiple inspections, slow payment, bad references and mischaracterization of the private business to another county, etc. a. The biggest factor is the status of the water system itself. b. There are 5 large mains leaving the Scott Candler Treatment plant. 4. 48” P’tree industrial>Winters Chapel >Chamblee Tucker>Mercer Univ. d.	Only 1 of these 5 mains is functioning properly, #4. 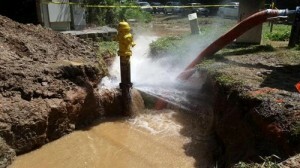 Number 4 is the main (water main) that caused the crisis last month. 1. #1 has valves turned off and all indications are that the County does not know which valves, nor where they are. 2. #2 has been shut down for some time due to a slip lining failure. It’s the famous line that had a lane of I-85 shut down for months last year. 3. #3 has valves turned off and all indications are that the County does not know which valves nor where they are. 4. #5 has valves turned off and all indications are that the County does not know which valves nor where they are. f.	The proof that there are multiple valves shut off is the fact that the entire County lost water when #4 water main was depressurized. g.	If the system was functioning properly we should have been able to isolate the section at Henderson Mill and Evans for repair while the other mains rerouted the water to the rest of the County. 2. What is the County doing to address this issue? Time to ask questions and demand results. a. County crews lacked experience working with these particularly difficult conditions. b. County crews were sent out with inadequate equipment. 3. County supplied pumps failed. More than 10 pumps were brought to the site including 2 $70,000 8” Thompson pumps. 7 of the 10 pumps were useless, including the 8” pumps. 4. Bureaucratic decision to re-pressurize the main before the valve could be reached, causing considerably more damage than was necessary. a. We are one errant tunnel bore, one excavator bucket away from an even larger crisis. If a contractor who is drilling/boring or a contractor excavating strikes the 48” main then that will be the beginning of another huge crisis. We will be without running water for God knows how long while it is repaired. b. If the only fully functioning transmission main #4 is actually struck, the County will be without water for days while it is repaired. c.	In addition, during the repair, the entire County water system will be completely drained. d.	This will cause an even bigger health crisis than the last time. e.	Many portions of the line will have to be sanitized before they will be safe, costing taxpayers’ huge amounts of money. f.	Re-pressurizing of the entire system will cause multiple line breaks that will need to be repaired at great expense. 5. Having thousands of residents and businesses in DeKalb County sitting in this dangerous situation while the County plays political games and favorites with the Watershed department is irresponsible. 6. We immediately need proper leadership at Watershed Management. 7. It is alleged that the last experienced man left at Watershed is XXXX XXXXX. He will be retiring in December. He is the most qualified man for the position based on his experience level with the County water system. Every effort should be made to retain his services.